Participating in organizations on campus is an integral part of the higher education experience. In fact, studies show that students involved in some form of extracurricular activities are more likely to succeed than other students. Through this involvement students have a chance to have a ton of fun, explore many opportunities, learn and practice valuable skills, have a lasting impact on the campus, and gain a greater sense of belonging in the community. The Center for Student Involvement (CSI) provides resources and assistance to new and existing groups. The CSI also serves as a liaison between organizations and the University community. Interested in starting a new student organization? Maybe you’re interested in restarting an inactive organization. Whatever your student organization needs are, please stop by the office (Blum 207) to get all the information you need! Nearly 100 different student organizations exist at Missouri Western. Click to learn more about the organizations available. Get involved in your Student Government Association and let your voice be heard. 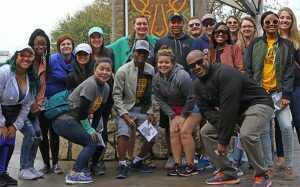 Getting involved can enhance your campus life experience and provide opportunities for community service and scholarships.